PORTLAND, OR – James Harris just wants to be self-sufficient. James Harris is an 18-year-old from Portland Oregon. As James began to approach adulthood, his mother Kathi started to think about unconventional ways that he could make money. James had always been interested in recycling, so it only made sense that he start a recycling business. 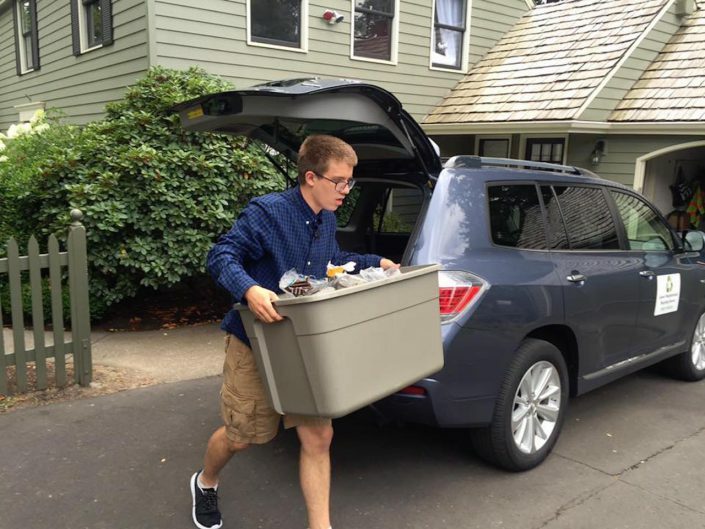 With the help of his Mom, James started James’ Neighborhood Recycling Service. A service that recycles items that the town’s recycling policy doesn’t cover. James does pickups every Monday, Tuesday, and Thursday morning, hopping out of his Mom’s SUV, and greeting all of his customers with a huge smile. Every client puts out a tall bucket full of things like electronics, plastic bags, and other hard to recycle items. “I’ve always liked recycling and always wanted to help the Earth,” James said. Currently, James has 50 customers and earns about $600 a month. His goal is to grow to around 1000 customers so that he can be self-sufficient.